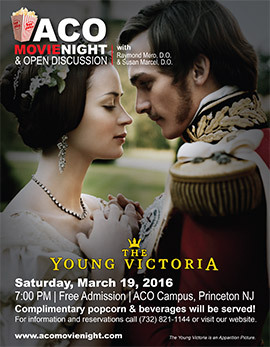 ACO Movie Night & Open Discussion featuring The Young Victoria - with Raymond Mero, D. O. and Susan Marcel, D. O. Based on the courtship and early reign of England’s longest-serving monarch, The Young Victoria is a majestic tale of romance and intrigue. Resolved to establish her authority over those who rule in her stead, a young and inexperienced Queen Victoria (Emily Blunt) draws strength from the love of Albert (Rupert Friend), the handsome prince who has stolen her heart. Victoria learns whom to trust and whom to mistrust, and ultimately comes to believe in herself as a woman deeply in love with her husband and as a monarch deeply in love with her country. The themes in The Young Victoria focus on the core themes of the ACO, namely love, work and knowledge and the film is a perfect follow-up to our recent social orgonomy presentation, “Balancing Work & Love.” Throughout the movie, Victoria struggles to find the balance between her relationship with Prince Albert and her work as Queen of England.